1. like Le Souk and/or The Style Files on Facebook (if you have not done already..), and..
2. leave a comment telling us where in your home you would use these stickers. The two winners (one who have liked Le Souk and one who has liked The Style Files) will be announced on 14th May. Hi! Nice give away! I’ve been following this blog for a while now on bloglovin and really enjoy reading it. These stickers are really nice! I’ve already liked bot h your page on facebook, and the Le Souk page ^^. I have a place in my home that is perrrfect for this gorgeous decoration. I am a student and I have moved into a student home almost a month ago, everything looks really nice but I don’t have a lot of money to get a lot of decorations so there is one wall in my small room that is still sort of sad and empty. I’ve been thinking of some things I want to put up there but I haven’t figured it out yet’; this looks really nice and I’d love to have it to complete my tiny student room! I love birds and I think it’ll be really great to help remind me that someday I can fly away from university when the school pressure gets really high! What a nice give away! These birds spread so much happiness. I’d love to put them in the entryway, coming out of a real birdcage! Ik heb zowel Le Souk als The Style Files “geliked” en ik weet al precies waar ik de stickers wil. Ik ben zwanger van ons eerste kindje en wil graag een mooi ingetogen kamertje (zonder heel veel schreeuwende kleuren), deze stickers zouden daar prachtig staan. Ik zie ze al verspreid boven de commode! I’d use them in my pre-teen daughter’s bedroom but I think I’d put them on a large canvas to hang as we’re currently renting and looking at moving next spring. Ooooh! Lovely stickers! We’ll be moving soon so they’d be great in our daughters new bedroom. 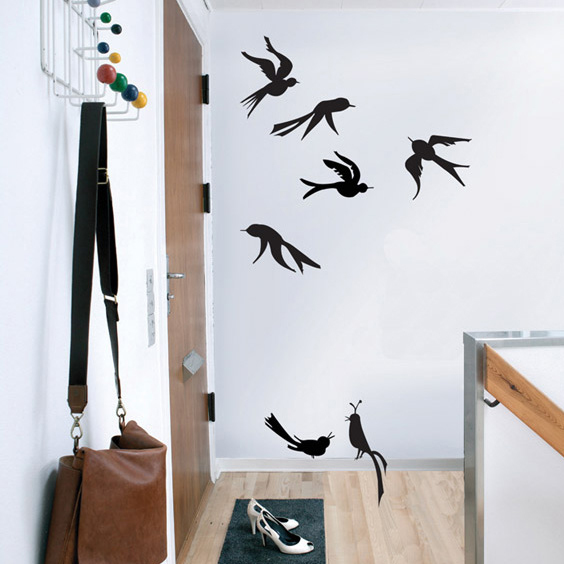 We’d put them flying across her wardrobe and onto the wall to tie in the room a little. Great site by the way! Great giveaway! I liked both… I would love to have these stickers in my sons bedroom…. he loves birds…. even talks with them 🙂 in our garden! So I would be great to win them… I am in! I would use these lovely stickers in my living room to give it some life! I’ve just moved and my walls are all naked, these birds would for sure fit them well! Love your blog and follow it for a while. I have liked your facebook page, and i often read this blog for inspiration! I study textile design at uni and it would be so nice to have these going up the staircase wall in my student house. would definitely brighten up my day!